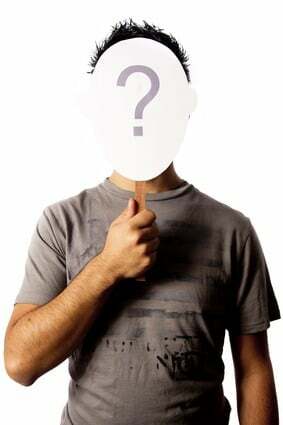 Does your website have personality? Is it showing that you’re a real person, friendly and a great choice to do business with? Or is it faceless, dull and boring? I wrote before that having no personality is one of the very common small business website mistakes. Your website often creates the first impression of your small business. When a potential customer visits your website they are looking at how capable you are of helping them and if you are someone that they could connect with. If they have a choice between two businesses and one looks bland and uninteresting while the other looks friendly and helpful who will they call? You’ve got it – the website with personality, every time. You need to have a welcoming website. But more than that, if you want to show visitors that you are the right person to help them, you need to show your personality. Give them enough so that they can connect with you as a person that they want to work with. So how do you add personality to your small business website without making it all about me, me, me? Keep reading, I’ve got three steps that will help. Adding your photo to your website is the first step in giving it personality. It’s very hard to create a personal connection with someone when you don’t know what they look like. Take for example Brian Gardner’s Website. 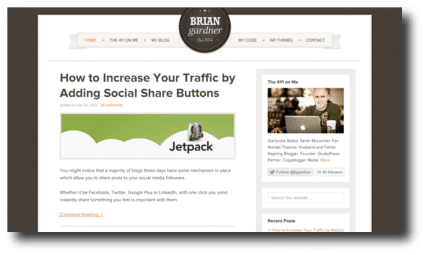 Brian is the founder of StudioPress and a partner at Copyblogger Media. As soon as you open Brian’s website you see his photo on the right hand side and can read an introduction to him. He shares the fact that he’s a Starbucks Addict and a Sarah McLachlan Fan. We already know something about him, we’ve started to make a personal connection. You might not like having your photograph taken, you’re shy or don’t have a photograph you like. But all you need is a photo with lots of natural light (mine was taken outside). It doesn’t even have to be taken professionally, ask a friend to help. Top Tip: Add your photo prominently to your website. Don’t just hide it on the “About” page, put it on the homepage. Use a quality photo that really represents you and your personality – and smile :-). The text of your website conveys a tone. When the reader reads your website it’s as if you are talking to them and it conveys your personality. How you phrase things and the rhythm of your text all adds to the tone. You can be the most interesting, friendly person on the planet but if your text is boring who will know – and what’s more who will buy from you? Ensure that the text of your website is written in the same tone that you use to speak to people. I’ve read several websites and then met the business owner in person and straight away realised that the text doesn’t sound the same as the person would speak. Be the best self that you can portray, but don’t try to be too perfect. Don’t try to be something you are not. Just draw from what is authentically you. Sure, make the text professional, ensure it doesn’t have errors and is easy to read. But ensure it sounds like you. If you outsource the writing of your content make sure you brief the writer well so they know the tone to write in. You can also edit it afterwards to ensure it sounds like you. Once you’ve written the text for your website ask someone close to you, a friend or partner, to read it. Get their honest advice on whether it sounds like you. Top Tip: A great way to ensure you write with your own natural tone is to start writing as if it was an email to your perfect customer. Write the content as if you were explaining it in an email to someone you know and then when you are finished paste it into your website editor. Your tone will sound more natural and authentic. Your small business website needs to tell your story to your readers. It helps them become interested in you. The more of your story you share the easier it is for people to get to know, like and trust you. Which are key steps in starting to build customer relationships. Paul Cox from SpinLessPlates does a great job of this on his website. 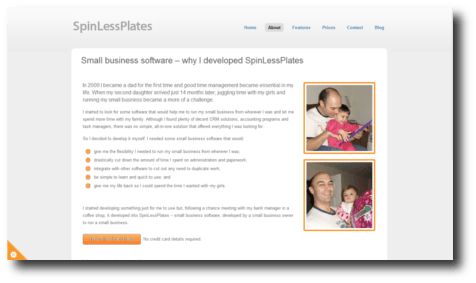 He explains the events that led up to why he created his micro business software. Include your experience in your story and help your reader understand why they should buy from you rather than someone else. Include lessons and share tips and always lead to a key point or takeaway. The more of your experience you include, and the more you give something that your reader will be able use, the more they will like you, keep returning and share your story with their friends, family and contacts. Top Tip: Share enough of your story on your website to get people interested in you. Show them that you’re a real person and help them see why you do what you do. All things being equal, people prefer to buy from someone that they like. Adding personality to your small business website will help prospective customers get to know you and could well be a deciding factor in whether you get their enquiry. What are your thoughts? How important is personality on a small business website? Another brilliant and very relevant post Rob. I think you’re dead right that people need to see the personality behind the brand especially for micro/small businesses. I know I have an “About me” section (with a photo) but isn’t on the homepage, maybe I ought to move it as possible no one reads it!! Putting your photo on the homepage makes it one of the first things a new visitor sees, so the personal connection is started from the very start. I think that really helps when you’re a small business as people buy from people. Thanks for the comment and feedback Ruth! Personality of your website is really important! People buy from people and so you need to ensure your business allows potential customers to know, like and trust you. I think this is even more important if you run say a micro business and you are the face of your company. It means you’re not just selling your products and services, you’re selling yourself too and so you have to factor that into your marketing and presentation of your business and your brand. In fact, I often find when working with clients that their personality is part of their business’s USP. After all, no one does what you do in quite the same way. I think it’s a benefit that needs to be embraced and exploited 🙂 A great blog Robert and one that contains an important lesson we all need to respond to. That’s very true. We all have our own unique experience, knowledge and ideas. Services are just a way to package “you” – the same named service from two different people can be very different. Bringing out your personality through your website helps your prospective customer see if you’re the one they want to work with and how your unique experience can benefit and help them. That’s why the About page is is so important, it’s not about me, it’s about how my experience can benefit you. Thanks for the feedback and great comment Georgina! I wish I’d see more of #1 and #3 on most real estate websites. I see lots of agents that hide behind company logo’s and don’t provide much information rather than generic copy on their About pages. Personally, I see that as a lost opportunity. Consumers are ultimately going to work with someone they can relate to…someone they like. By adding that little bit of a personal touch, you allow for that connection to take place. If you don’t add personality, you’re just making it harder for them to want to work with you. That’s so true Ricardo – your personality and story is one of the very unique things about you. Helping website visitors see this personality through your picture and story can differentiate you, not just in a compelling way, but in a way that your competitors find it harder to compete with. Competitors can compete with us on on sales price, commission, the property marketing service but if someone is drawn to work with you because they connect with you and like your personality it’s much harder for a competitor to gain the business. Personally one of the first things I do when I visit a new website is have a look who is behind the company, what they have to say, what they’re interested in, etc. A potential customer might not be able to decide between two competitors and something as small as a shared interest with the business owner could be enough to get him to call that business first. I think it’s really key. Thanks for opening my eyes by realizing the importance of placing the picture on my profile. After going through your post I have placed my photograph on my Author page. That’s great Sapna, I’m really pleased it was helpful. Having your picture on your website makes such a difference to showing your personality and helping people get to know, like and trust you.